John Whelan says the EPA is ‘asleep at the wheel’. A SENATOR HAS accused the Environmental Protection Agency of ‘being asleep at the wheel’ after carcinogenic materials were released in Portlaoise just 150 metres from homes. John Whelan told the Seanad that a “blind eye has been turned to what is going on” in relation to the Enva plant in the town. The hazardous waste facility processes waste oil under an Integrated Pollution Licence. As part of this licence, the company is not licensed produce process emissions. However, in a memorandum to their board of directors, they detail releasing benzene, a Group 1 carcinogen, into the atmosphere during the drying process. Source: Can't read this? Click here. 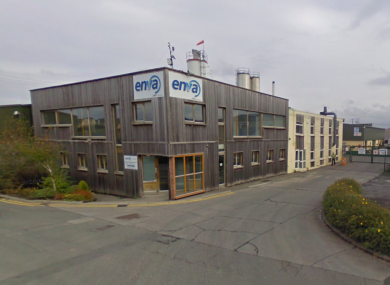 Residents have been making complaints about the smell coming from the plant for 15 years and Iarnród Éireann say that staff in an adjacent yard suffer headaches as a result of the emissions. 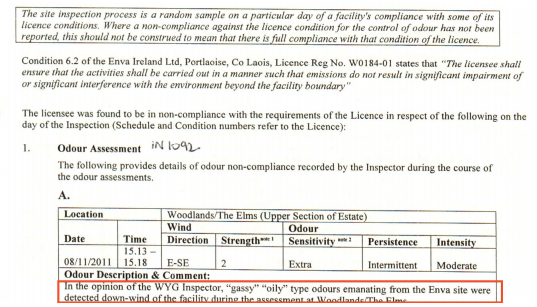 In 2011, independent inspectors WYG carried out an examination of the odours coming from the plant on behalf of the EPA. They found that Enva were in breach of their licence. In a response to this report, Enva disputed the finding and no action was subsequently taken. Senator Whelan, speaking under Oireachtas privilege, said that this was an “Erin Brockovich scenario” and said that the EPA has “fobbed off” those who raised concerns. “A litany of documentation proves a series of non-compliance. The people who have come forward have been fobbed off and categorised as cranks, while a blind eye has been turned to what is going on. This is an Erin Brockovich scenario where people are living in silent fear and do not know what to do. It is our duty and responsibility as public representatives to ensure that this is not allowed to continue any further. He accused the EPA of not acting. “If we have a watchdog we should be able to rely on it. What is the point in having a watchdog if it does not bark, much less bite? I believe it is the corporate culture of the EPA to work hand in hand with corporate elements and industry rather than putting the public interest and public health first and foremost. The EPA says that it has received 18 complaints about the facility. “Only one complaint was received in the period 2013-2014. The EPA treats every complaint seriously and the Agency has gone to great lengths to investigate each one to determine whether or not there might be any issue that would give cause for concern. Every single assessment carried out has satisfied the EPA that that there is no risk to local residents, to health, or to the environment. “As with any licensed facility, minor issues have arisen from time to time through inspections, incidents or complaints and the EPA is satisfied that ENVA has taken appropriate corrective action to address these. In a statement, Enva rejected what they said were “unfounded allegations”. “The facility, which employs 75 people, has a very strong record of compliance with its waste licence and has always engaged constructively and cooperated fully with the Environmental Protection Agency in relation to all matters and will continue to do so. “Enva strongly rejects the unfounded claims made by Senator Whelan under Oireachtas privilege. We regularly carry out monitoring at our Portlaoise site to ensure our staff are not exposed to levels of substances that would impact their health or the health of anyone living in the surrounding area. 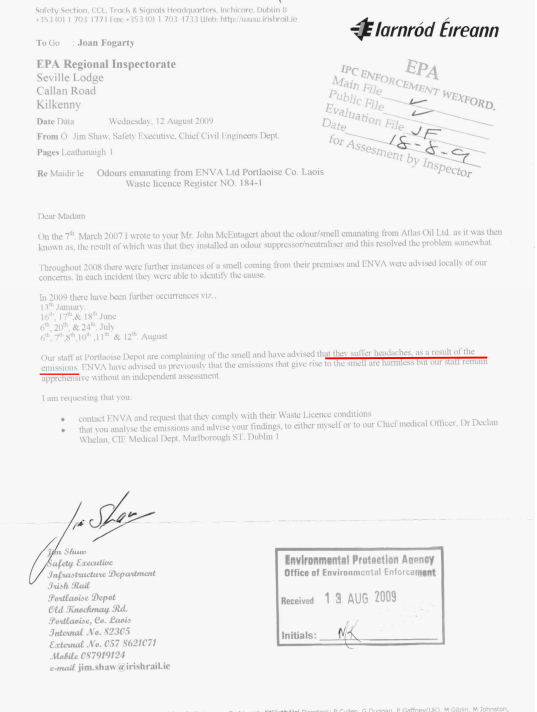 Email “EPA accused by Senator of not acting on carcinogens released from Portlaoise plant”. Feedback on “EPA accused by Senator of not acting on carcinogens released from Portlaoise plant”.